Enjoy a drink at a pub by the river in Prague, take in the city's riverside attractions and watch the boats sail by. 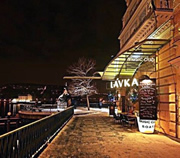 Lavka is a popular bar by day and by night. Lavka is made for al fresco drinking. On a warm summer's night, the riverside terrace at the rear is one of the best locations in Prague for a drink; it stretches 30m alongside the river, right next to Charles Bridge. There is a second smaller terrace at the front open all year round, with heaters by the tables providing much needed warmth in the winter.